I wrote this in May of 2012 but I thought I would repost it. My friend Noelle posted this on her Facebook and it got me thinking. 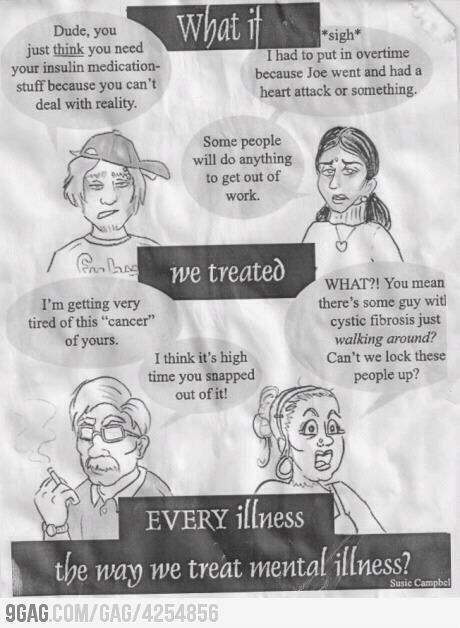 What if we treated other illnesses like they were mental illnesses? It got me thinking that some people still treat Autism as if it was a mental illness. As if somehow having Autism made us crazy or mentally unstable or at the very least deserving to be treated as if we were less than human. Then I got to thinking, I write this blog so that one day I won’t have to write it. I write it so that one day Autistic will be completely synonymous with human in the neurotypical worldview and not equated in some cases with mental illness. The day we are treated as equals and as fellow human beings is the day that we autistics will be quiet. It’s the day we won’t blog. Its the day that the world won’t need us to say anything because we will be understood. I believe that autistics and other differently-abled people are given the responsibility to educate humanity on it’s shortcomings and cry out at injustice. As Dr Martin Luther King, Jr. said, “Injustice anywhere is injustice everywhere.” Our words are both a sword and a shield against the intolerance and injustice of humanity. We are in a pitched battle to save the very soil of humanity from the depths of it’s own depravity and from the legions of those who are against and are led down the path of ignorance. We as autistics who are capable of putting pen to paper or putting words in mouths have a moral obligation to do so. Especially for those of us who can’t speak or write. Our words are the swords that educate the world and they are the shield that shall protect us from the spread of ignorance. There shall be nothing written or said about us without us writing it or saying it. I had to unfollow/unfriend lots of autism self-advocates on social media because of the hate they spread. I make no apologies for that. Tolerance goes both ways. And by autism advocates I mean autistic self-advocates who cannot separate the good parents from the bad. These autistic advocates have taken to vilifying all parents of autistics unjustly. Then again many autistics have experienced bullying and abuse at the hands of non-autistics and have grown to hate them as a result. These advocates ask for compassion and often give none in return. I prefer to love people and to spread love. I have seen many self-advocates take this stance: if you don’t agree you are a terrible bigoted person and you should be quiet. One of the biggest issues is that of the Kelli Stapleton case. The negativity that come from some autistic self-advocacy groups is troublesome. I am an autistic self-advocate but I don’t fall in to this victim mentality that some have fallen into. I have never met a parent who is perfect and I know for a fact that most parents are trying to do what is best for their kids. That being said I also understand where most of autistic self-advocates are coming from. Many of them have been abused, beaten, bullied, and victimized by non-autistic people which has led them to be angry and possibly have PTSD. They are so angry that when they see things like this it brings back many of the experiences that were negative and painful and they assume this defensive position that talking about why Kelli Stapleton tried to kill her autistic daughter Issy is the same thing as condoning it. Its not. Trying to understand something like this is done simply to prevent it. Parents often get little to no assistance. These autistic self-advocates often don’t realize the adverse affects their behaviors can have on their families and loved ones because of their mindblindness. If i was in Kelli Stapleton’s position I cannot say I would have done the same thing, but I can say I understand why she did it. When are autistic self-advocates going to stop blaming parents for everything? Just because they had bad experiences in life doesn’t mean every parent of an autistic child is terrible. Parents of autistics are our natural allies and not our enemies. As long as we are at each others throats we will gain nothing. A house divided is a house that will fall. I was raised with the idea that having a disability was not something to be ashamed of. I watched as my mom worked tirelessly to get my a diagnosis and taking me to the doctor on a regular basis after I got it. I watched as she advocated for me struggling against a system that wanted to deny me services and that I was even autistic. I watched as she took my case to against the Regional Center in California to court. The case set a precedent in California and and was one of the first times that Aspergers was legally recognized as autism because that was the issue of the case we filed in 1997. That’s who my mom is and that is who most parents of autistic children are. They are people who will fight to the ends of the Earth for their children. And as their children get older they will fight alongside them.